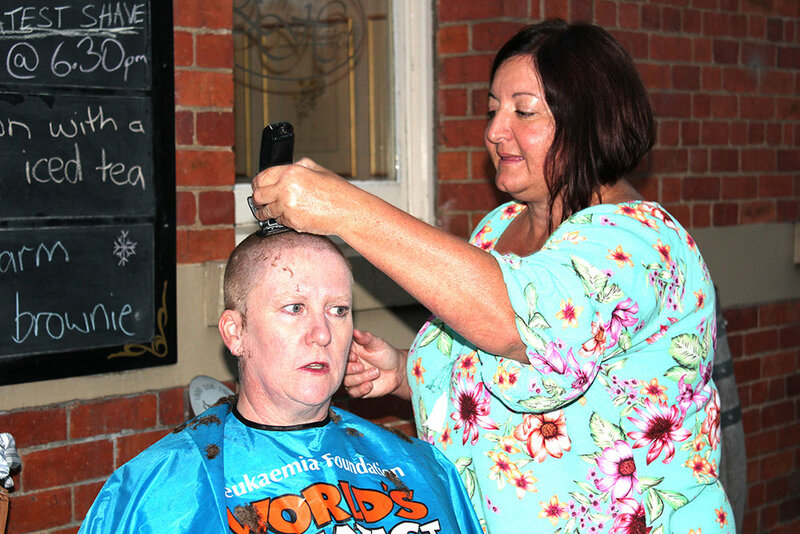 Outside the Empire Hotel for the 21st World’s Greatest Shave, hairdresser Liz Walker wields her clippers on Mole Creek cave guide Angela Enright. ONLOOKERS DECLARE without a doubt that four fearless people had a close shave outside the Empire Hotel on the 22nd March. Friends, family and supporters all gathered around to spur on hairdresser Liz Walker, as she took to the three sponsored entrants and one passerby with her clippers. The head-shaving event was for the Leukemia Foundation’s 21st World’s Greatest Shave campaign. Kim Lord, maintenance at Deloraine Primary School, was motivated by his own current cancer treatment to do the shave. “My hair was going to come out anyway!” Kim said. “I was walking down the street two days ago, when I saw a Greatest Shave sign and then decided to do it. It is the best thing I have done.” Kim has raised around $1,200, thanks largely to the staff at the School and Timber World. Mole Creek cave guides Angela Enright and Shannon McMonagle were next in the chair. Angela credits Shannon for getting her involved in the campaign, which she decided to do because her dad suffered a blood condition and she had lost a good friend to leukemia. “The aim of the annual campaign is to raise money for blood cancer research, so every little bit we do helps,” Angela said. Shannon and Angela raised $1,300, not including donations on the night. All participants gave a heartfelt thank you to Liz, the Empire Hotel, and all their sponsors and supporters.